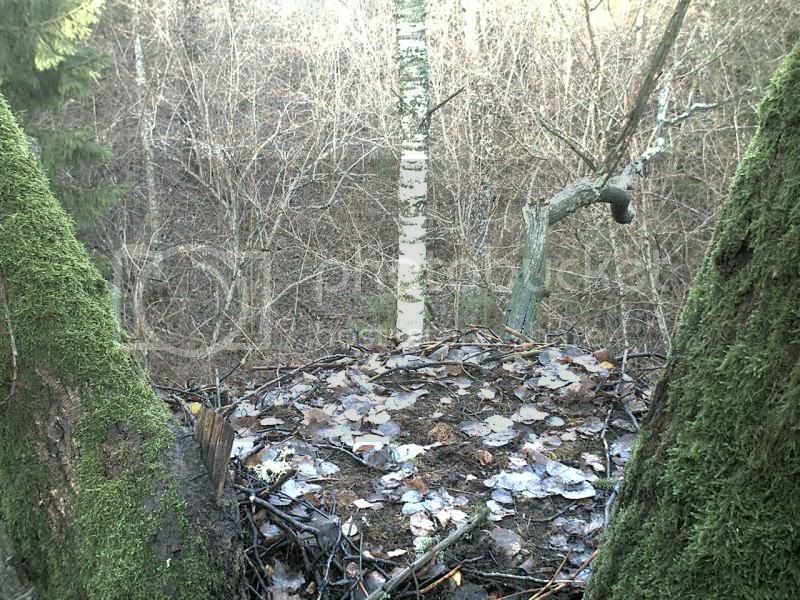 This is the nest of Black Stork pair Tiina and Tiit. It is situated in Läänemaa, western Estonia. Local farmers know the nest site already from the Soviet kolkhoz period. 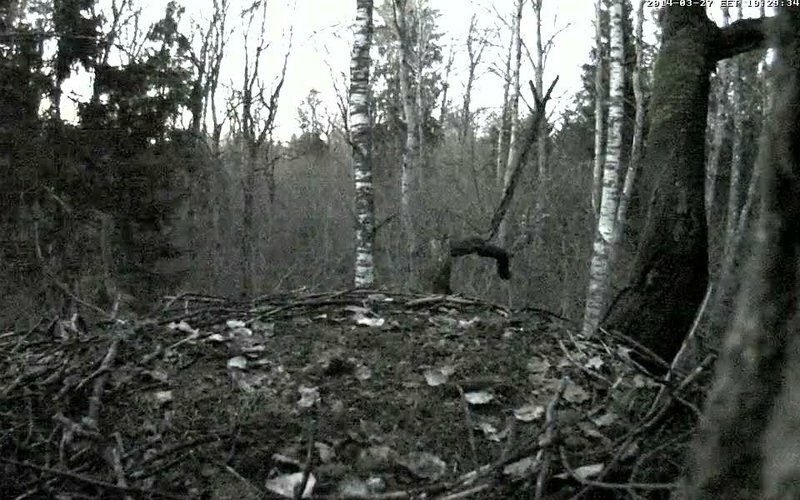 The nest is quite far from roads, about 2 kilometres as the crow flies. In 2009 three chicks grew up there. The 2010 nesting failed; in July there were only egg shells under the nest. In 2011 four young grew up in the nest; we could watch, with somewhat varying success, how they grew up and left the nest. In 2012 there were four eggs, three hatched. One injured its beak and had to be taken out of the nest to the veterinary hospital. Unfortunately all attempts to help the storklet failed. At the end of the last season a young White-tailed Eagle gave us a fright when he visited the nest while the two young storks still spent time on the nest. So we can be curious to see if Tiina and Tiit return or if the nest stays empty or gets new inhabitants. This year it seems the camera was placed at a different, much lower angle. 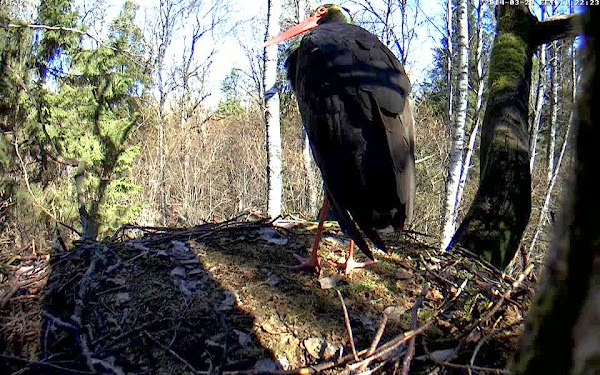 When the camera started for the first time in 2011 (April 21), Tiina and Tiit already had one egg. This season 4 eggs were laid and four chicks hatched, which the forum people called "Üks" (One), "Kaks" (Two), "Kolm" (Three) or Johanna and "Neli" (Four). All four fledged successfully, after receiving their rings (711C, 711F, 711J and 711T) on June 28, 2011. In 2012 the first stork was seen on the nest on March 28, both together were seen first time on April 10. In 2013 Tiit arrived on the nest on April 16 and Tiina arrived on April 18. The nest was still deeply covered with snow in the beginning. 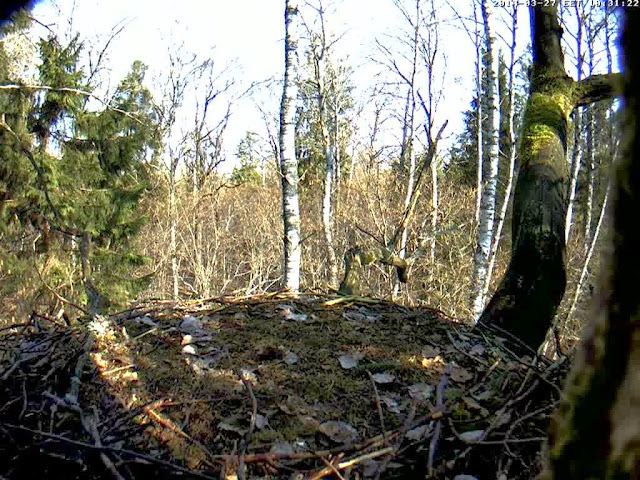 April 12: around 9 AM, Tiina laid an egg in the nest. Tiit has not returned so it is assumed that the egg is not fertilized. April 18: At 15:54 in the afternoon another egg appeared - and was almost immediately destroyed (at 16:33, the male ripped it apart). April 21 At 06:48, Tiina laid an egg that surely must have been fertilized by this new male - he preened her while she laid it. She flew to the parent branch. At 06:58, male picked up the egg, shook it, and tossed it over the side of the nest. 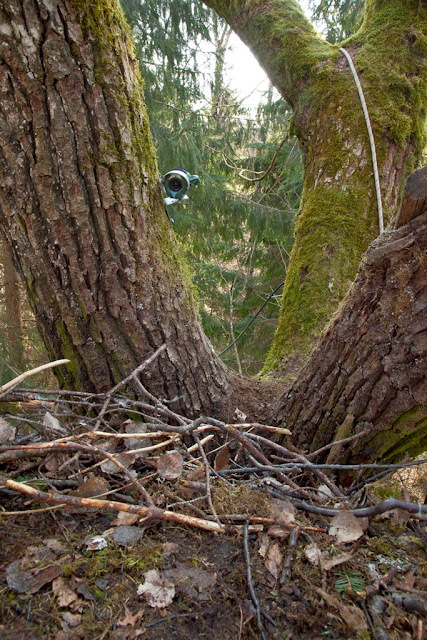 April 22 Tiina and the new male were last seen on the nest in the afternoon. The camera started working today morning. At the moment we have no further information. Some bird can be heard calling. It looks like somebody worked with the nest and brought some branches. Only the leaves have become a bit less. Felis silvestris wrote: This is the nest of Black Stork pair Tiina and Tiit. This year cam is with night view! If this is a night vision cam it is not as it should be, hm? This year Tiina should be the first and Tiit the second to arrive. Lets first hope that they arrive safely at all! I do hope Tiina & Tiilt arrive home safe & well. If you can,please DONATE to help cover all the costs. MARVELLOUS! The cam is going! So it can't last much longer that one of the storks will come. Raivo, for example, must be already in Estonia. 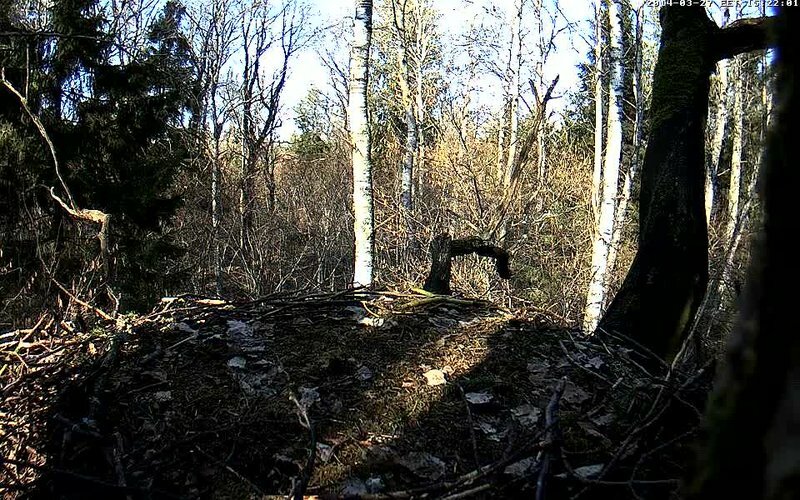 now i see that the camera angle in the horizontal is nearly the same as last year: the birch in the background is almost in the centre of last year's picture and now. the camera is just pointed a bit higher so that the sky can be seen. -nice view, i like it! 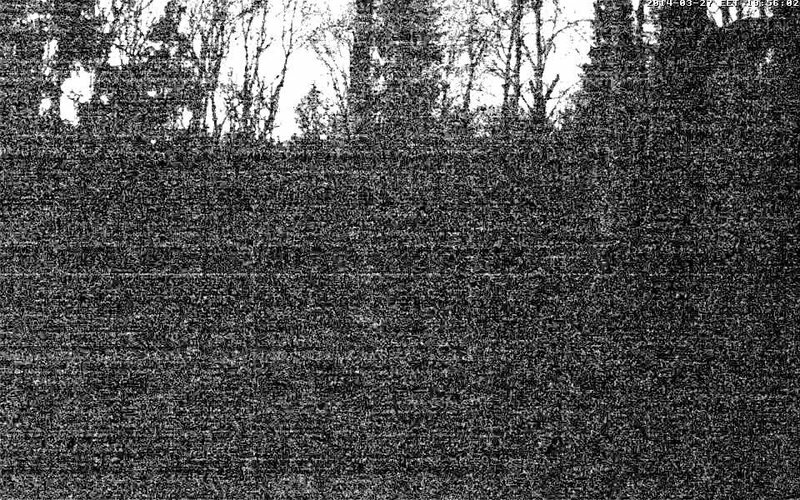 that i think also would explain why the pictuer is seen later in the evening: the evening sky is so light that it is enough to keep the camera going. Great news! Thanks to everyone who contributed to launch the camera. Nice to see you all, folks. Have a wonderfull Spring.